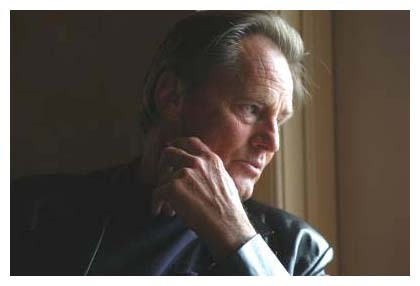 Sam Shepard laughs more than you'd think, considering the actor-playwright's sun-cooked cowboy persona, which dons the dusty, romantic despair of a desert loner. Namely, Shepard laughs at me. He has a great dry chuckle that heh-heh-hehs whenever I demonstrate my sweeping ignorance of things cow, horse, rope and ranch. This happens often. Best remembered as Chuck Yeager in "The Right Stuff," Shepard was in Austin on Saturday to screen his film "Don't Come Knocking" during South by Southwest. He was disappointed that the movie wasn't playing at the Paramount Theatre. "That's one of the reasons I wanted to do it," he says in a soft drawl. "That beautiful big theater. Shepard co-wrote "Don't Come Knocking" with director Wim Wenders, their second collaboration since "Paris, Texas." Tall, lean, with striking blue eyes, Shepard, 62, cuts a suave figure in a black leather blazer, blue jeans and fancy cowboy boots. He sits down in the Four Seasons hotel bar and orders iced tea. He has written dozens of plays, including "Fool for Love" and "True West," and acted in more than 40 films. One of those films is Terrence Malick's "Days of Heaven." Shepard was having dinner with Malick and Wenders that night. I ask if I can come. He just laughs. Q: Yesterday I interviewed John C. Reilly. He says hi. Do you have any words about him? SS: He's here? I didn't see him. He's a remarkable actor. We had a lot of good fun doing "True West" together (in 2000 on Broadway, with Philip Seymour Hoffman). It was unique in that he and Philip would switch roles every two nights. The transformations were amazing. Philip just won the Academy Award, bless his heart. Q: How does "Don't Come Knocking" fit into your body of work? It's set in a familiar world of yours with a familiar character, but it's steeped in valediction and redemption much like Clint Eastwood's "Unforgiven." SS: I really don't think about any of my work like that. I don't know how to categorize it. I just go instinctively with certain ideas and allow those ideas to play themselves out. Because I'm the same person, obviously there's going to be similarities with what's done before. But if anything, Wim and I were trying to avoid similarities to "Paris, Texas." Q: Yet there are thematic similarities between the two films. SS: Of course there are. The main characters share the same sort of alienation and strandedness and remoteness. Q: Is that where the wide-open settings come into play, as metaphors for the characters' predicament? SS: Yes. It's interesting to set characters like that against an overwhelming landscape, almost like he's lost in the ocean. Q: What kind of boots are those? Q: Leddy? Is that a famous brand? SS: Yeah, man! Where you from? (Laughs) These are made in Fort Worth. They're belly ostrich. Q: That's ostrich? I notice your belt buckle's kind of elaborate, too. SS: I have cutting horses. I won this. Q: You won that? It's like a trophy? SS: Yeah. WHERE are you from? Q: Can you tell me what cutting is? SS: It's an activity with quarter horses where you go in and separate cattle and keep the calf from getting back into the herd. It's an old art form. Q: The buckle says you won it in 2003. Is it gold, some valuable item? SS: I'm in the middle of a play right now. Q: One of yours that's currently being staged or a new one you're writing? SS: I'm writing a play. I'm a playwright. Q: I know. (He laughs.) Your (Pulitzer-winning) play "Buried Child" is being staged right now. SS: It's a workshop production that I didn't even know about. And someone's doing "The Late Henry Moss." And I'm acting in a new film in Shreveport. You follow horse racing at all? Probably not. There was a famous filly called Ruffian in the '70s, an extraordinary horse. Every time she ran she broke a track record. She died in a match race against a colt, snapped her leg. I'm playing her trainer. Q: Sounds perfect for you. Who's directing? SS: A guy from Quebec. I don't really know his name. (Laughs) A French guy.